In Latin, persona is defined as an actor’s mask. As such, it’s associated with characters in a drama. Expanded more broadly to writing, a persona is a character representing the thoughts of a specific person. This person acts as the writer’s mouthpiece, emphasizing the person’s subjective qualities and expresses the writer’s ideas, beliefs and voices. Regardless of any similarities with real people, living or dead, a persona is a fictional character. The persona also assumes a defined set of characteristics in the environment where he lives. It’s in this role that personas have been borrowed and adapted for marketing purposes, especially in light of the explosion of information, channels and devices. Because by understanding your audience and their hot buttons, you can craft more effective communications. With the explosion of social media, content marketing and mobile (or connected) devices, you need a marketing persona. Because your marketing must talk directly to your audience and resonate with them or they’re gone. The use of personas to improve marketing isn’t new. To better target their marketing messages, direct marketers have used customer acquisition and past buying behavior data to better understand their audience in terms of demographics, psychographics and interests. To put this in perspective, the average American spends 12 hours and 14 minutes with media per day! Therefore, you need to do your homework to provide the information they need and want before they realize it. For marketers, personae get employees on the same page. 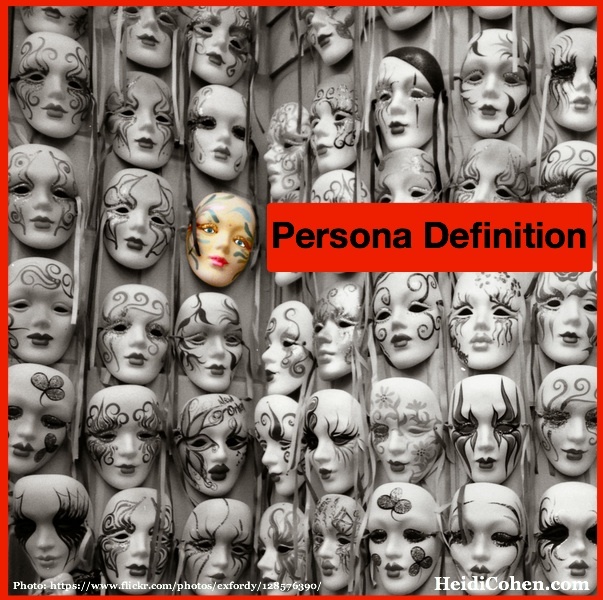 Persona defined in a marketing context encompasses these 10 essential attributes. When answering these persona questions, be specific just like an actor has to prepare to be able to walk in someone else’s shoes. 1. Who is your persona? What is his name and age? What does he look like and how does he dress? What level of education does he have? Where is he located? Is it a city or the country? What are his living arrangements? 2. What does your persona do for a living? What is his job? What is his specific title? Does he identify himself based on his work or profession? What are his feelings towards money? Is he a penny pincher or generous? Does he keep a budget? Does he save or invest money on a regular basis? How does he pay for purchases? Does he use cash, debit cards, credit cards or electronic payment systems? 3. What are the persona’s non-work interests and/or hobbies? What are his hobbies? Are they outwardly or inwardly focused? What passions does the character follow that aren’t his job? How does this color his world and where his focus is? 4. How is the persona’s health and well-being? Is the persona healthy? If not, what type of health issues does he have and how do they effect his life? What type of diet does he follow? Does he have any food restrictions? Does he exercise on a regular basis? If so what does he do and where does he do it? 5. What makes the persona tick? What is the persona’s point of view (aka POV)? What does the character believe with regard to politics, religion and other major issues? What are his hot buttons? What gets him worked up? What are the his life goals? What role does family play in his life? 6. Who is important to and influencers the persona and why? Amongst the people who play a role in the persona’s life, who is important and why? Consider spouse, children, parents, friends, boss, co-workers and social media connections. Are these influencers involved in his buying decisions? Who is the ultimate decision maker? 7. What type of products has the persona bought in the past? What type of products does he buy? For whom, does he buy stuff? Roughly how much does he spend on a monthly or annual basis? Does he buy things for show or for long term value? 8. What media does the persona consume? What information does he seek on a regular basis? What media channels does he use? Include television, radio, magazines, newspaper and online. What information does he seek before, during and after making a purchase? 9. Which social media platforms does the persona participate on? Is he a lurker, commenter or creator on social media? Here’s how to create a social media persona defined in detail. How much time does he spend on social media either daily or weekly? Were past purchases influenced by social media? Do they share purchases on social media? 10. What devices does the persona use? Does he use a smartphone? Does he have one for work and one for personal use? What apps and/or functions does he use on a regular basis? What other devices does he use? Specifically does he use a computer (or PC), tablet, gaming system, e-reader? What type of devices does he use in his car (if he has one)? A marketing persona is a fictional character that represents and communicates attributes of distinct set of people within a target market. It’s based on both qualitative and quantitative information. Most importantly, even if you fit the target demographic for your offering, your priorities as a marketer aren’t the priorities of your customers. What else would you include in your persona? 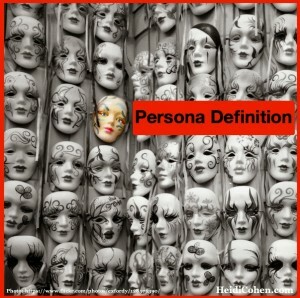 Tags Definition, marketing persona, Persona. Bookmark the permalink. Coke personalization campaign. Read it here http://bit.ly/1ujZ3k8.